Register Log In ECN Forum Forums Violation Photo Forum Spin the barrel and load the gun only one bullet here! Just saw an identical loaded gun today. It was on a wet scrubber, and when I pointed it out to the employer... he said... there wasn't ever a ground prong on that plug. I felt embarassed at my ignorance... I guess they just put those holes in the plugs to trick us dumb and dumber inspector types that ask too many questions. Sometimes I blame the maker of the plug for stuff like that. I've used those molded plugs where, if the ground prong was bent a little more than once in its life, it just broke off and fell out. I see missing ground pins on the orange "heavy duty" extension cords for the vacuum cleaners used by the cleaning staff here at work. The ground pin is a little tube, crimped at the end. They break off quite easily. In fact here at work, last week I found one of those pins dangling in the light socket here in my room!! Usually just better to snip that piece of garbage off and install a REAL cap. My wife broke her foot, and as a result was using the little "service chairs" (power carts) at a local grocery store. This one had an attached, auto-retracting cord on the back. Guess what? Except for the color, it looked just like your pic. I have an old flat ribbon extension cord that recently lost its ground pin off its cap. Replaced it only to find that the ground wire (middle wire of the 3 wire ribbon) was broken at several spots thruout its 100 foot length. The cord was too useful for light loads (powers the boombox while raking leaves and such) to toss, so both ends got 2 prong plug/sockets. The old ground wire was abandoned (snipped short to avoid contact with anything inside the plugs). When I was in 1st grade, my teacher had a 100ft, 12AWG extension cord that she used for a lot of things. One day she unplugged it from the Wiremold Raceway Outlet, and, SNAP!! 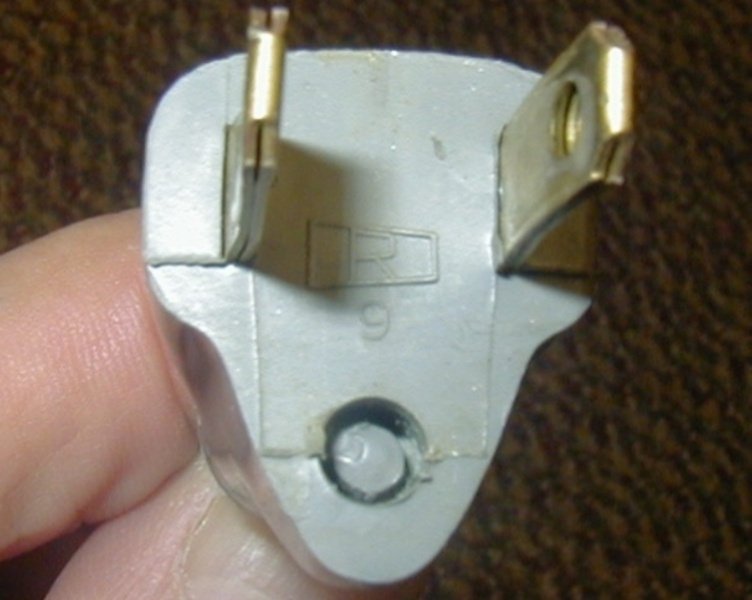 The ground pin fell out of the plug, hit the hot and grounded prongs, andfell to the floor. was the plug mounted ground up or down in that situation? I'll bet everyone who wouldn't be caught within three blocks of that plug drives a car more than 40 miles a week. I know I'm gonna catch it for that and so be it. But check some statistics and let me have it either way.